If you’ve ever had the uncomfortable discovery of pink-colored toothpaste in the sink, you may know the effects of gums that bleed when brushing. But how do you know if this seemingly small dental problem won’t lead to others? Find out by reading below or visiting your local dentist in Northern Virginia at Priti Naik DDS! Red Or Bleeding Gums? It’s NOT Normal! Most people you meet will tell you that they have had a sensitive tooth, toothache or noticed that their gums bleed after brushing. But rest assured, although these common dental concerns seem common, they may still need professional care. Reddened or bleeding gums can be a sign of over-brushing or flossing with too much force, but they may also indicate a more serious and chronic dental condition known as gum disease. Itchy, red or swollen gums may be symptoms of gum disease or gingivitis, in which harmful plaque and dental calculus form a strong barrier of tartar on the teeth. This buildup of debris can lead to a chronic inflammation of the gums and result in tooth decay, mouth pain, sensitive teeth and gums that bleed when brushing. In its more advanced form of periodontitis, this destructive oral condition may need a treatment known as scaling and root planing to remove bacteria from below the gum line. Treating gum disease is usually a simple process that requires diligence by yourself and your dentist. 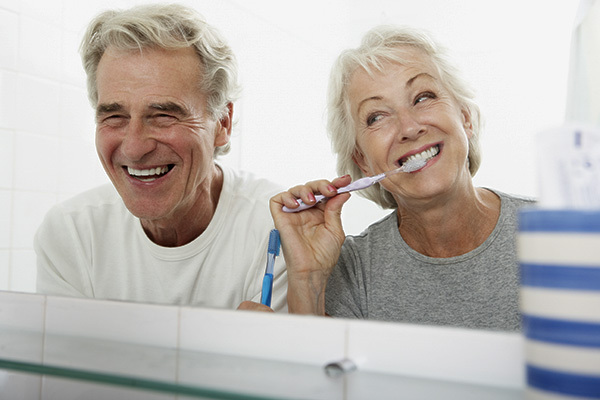 In its earlier stages, brushing and flossing regularly and using a fluoridated toothpaste can make a large impact on reducing or preventing symptoms. But to best ensure that you have effectively recovered from or prevented gum disease, it is highly recommended to keep up with regular visits to your dentist for quality dental cleanings and to monitor your dental health. Dentists nationwide are continuing to tie the effects of dental health to the systemic health of the entire body. Gum disease in particular has been lined to certain health conditions such as cardiovascular health, Alzheimer’s, stroke, and pregnancy complications such as preterm birth or low birth weight. To best protect your entire body from the effects of poor dental health, practice regular brushing and flossing and visit your dentist every six months for a bi-annual dental exam, where preventive dental care can have a large impact on your overall health. At Priti Naik DDS our team is dedicated to serve you as your best family dentist in Vienna. If you or a loved one hasn’t been to the dentist in awhile or has noticed a change in their dental health, give us a call at (703) 288-1800 to schedule a convenient dental checkup. In our welcoming dental office, we look forward to providing the best quality dental care for your unique dental needs. Smile confidently at your gentle dentist with Dr. Priti Naik!